A fun, two part, Steve Dillon drawn Rogue Trooper story finishes this prog. Whilst doing a bit of bio-chip spring cleaning, you know, like scrubbing out their slots and greasing up the equipment, Rogue is blinded temporarily by a Nort bomb blast. As a result, all the chips are placed back into the wrong slots so, for example, Gunner is in charge of the helmet (what a responsibility). Interestingly, none of the bio-chip buddies seem able to operate any piece of equipment other than that which they are trained in as indicated by the name on each of their birth certificates. So, for example, when Rogue asks for a grenade, Helm dispenses a light bulb from the backpack by mistake. On the surface, Rogue seems to be a well organised unit leader but the bio-chips not having full equipment training seems to be poor resource management and an oversight bordering on negligence. If I was his superior officer, thanks to this and failing to find the Traitor General by the agreed deadline, I would have no choice but to rate him as underperforming in his end of year appraisal. The strip itself has been overrunning onto the back cover recently which means that the final page is in colour. 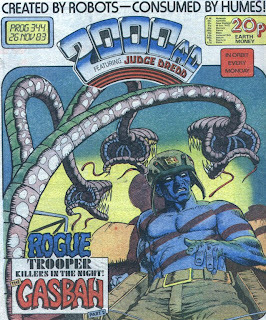 As I’ve mentioned before, I like seeing Rogue Trooper coloured in. In a visual sense, black and white Rogue looks a bit like a war strip from Warlord or Battle. In colour, we’re reminded that there is something exceptional about the character. First time around, I had a little difficulty with The Ballad of Halo Jones, up to the third episode of its first book this prog. I think I must have been looking forward to it starting in 2000 AD so much that when it appeared and didn’t seem to be anything like Marvel Man or V for Vendetta I felt a little disappointed. This was compounded even further by my efforts to make myself like it. For example, I remember concentrating on the crazy, invented Hoop slang that Alan Moore was writing so hard that its infectious rhythms escaped me. As early as one year later, when I re-read it, I was surprised that I had had trouble with Book One at all. It’s great, obviously. I was the problem. Even during this period where I was baffled by every other word that Rodice uttered, the personalities of the female characters shone through so convincingly that each one reminded me of someone I knew at the time. Re-re-reading it now for The Slog, I’m reminded of those same girls from 1984 and not current women I know. This isn’t an observation on the thrills timelessness or otherwise; it’s a comment on how I no longer have anything to do with teenage girls. I can, however, confidently present The Ballad of Halo Jones with The Slog award for the thrill that has made me feel the most nostalgic so far. This isn’t necessarily a compliment. Engaging in nostalgia can make us lazy and we should push it from our hearts as soon as we feel its warm tendrils embracing us. Important note: The Slog is an appreciation of a weekly comic that has published a considerable amount of strong strips and NOT an exercise in nostalgia in and of itself. Thank you. It’s 1984, and Titan Books seem to be reprinting everything from 2000 AD that is half decent; everything, that is, except for Strontium Dog. Admittedly, one volume exists but that seems to be about all. In their American colour line, all that we see, despite the quantity of good material that exists, is a four issue limited series. 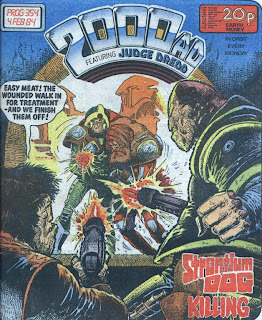 Admittedly, Eagle Comics’ successors, QC, go on to reprint the majority of Strontium Dog stories but they do such a poor job on reproduction that I find that it’s best not to think about it. I mention this because it’s a mystery to me that Strontium Dog stories have only been reprinted in an ad hoc, casual manner at a time when everything else of quality is being made available in all comic formats. It’s only now, in the twenty-first centaury, it is being treated with a gravitas that it deserves thanks entirely to the strict chronological reprinting of the stories in the “Agency Files” series of books. In Strontium Dog Outlaws, currently up to part 15, Johnny Alpha and Wulf Sternhammer have been framed for the murders of a group of residents of the planet Jock’s Landing. Since then, they’ve been on the run from their colleagues at The Dog House, keen to cash in their bounty. It’s not all bad news for the fugitives though, helping them out are Johnny’s old friends from The Mutant War; the Torso from Newcastle, Frinton Fuzz, Evans the Fist and Middenface McNulty. Although Outlaws isn’t Middenface McNulty’s first appearance, it is the story in which the character comes into his own. This is, in part, thanks to Alan Grant and John Wagner’s authentic reading accents and affectionate portrayal of the Scottish. Jock’s Landing, for example, is the only place in the galaxy that we see Johnny visit where he’s not on the receiving end of hostility because of his mutation. Admittedly, he is with McNulty and the surviving residents did all sign statements before saying that he committed terrible acts of murder that they know the brothers Stix did but, you know, they did say sorry. Wasn’t it only a few entries ago that I commented on how Cliff Robinson was an art robot built to draw Judge Dredd? I understand Robinson once appeared on the ITV1 show Droids in their Eyes; “Tonight, Matthew, and for the foreseeable future, I am going to be… Brian Bolland.” To be fare, all comic artists will have been influenced by a predecessor to some degree. Look at Brian Hitch with Alan Davis or Cam Kennedy with Mike McMahon. If you’re going to be influenced by another artist then it might as well be someone as good as Bolland. 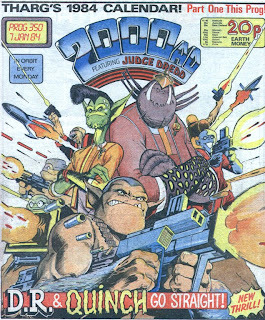 Robinson draws judges, the population and Mega City fashion perfectly, just as I had suspected he would. Where he fails is the environment. Vehicles look stiff while buildings are literally blocks with black holes for windows rather than the curved, mushroom shapes that we’ve become more used to. 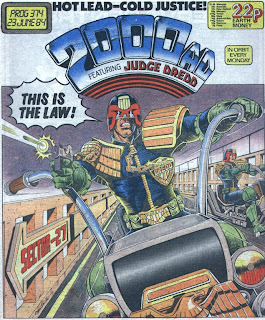 But I understand that I’m making a judgement on his work compared to Bolland rather than acknowledging that, as first Judge Dredd drawn strips go, he scores very highly. I can’t be entirely sick of Future Shocks at the moment because I did enjoy A Droid in Distress written by "RCH Bonsall" and drawn by John Stokes. In it, scientists test their time machine by sending a robot back to the Middle Ages before realising that they hadn’t thought of a way to get it back. That’s scientists for you; academically great but rubbish when it comes to using common sense. The story ends with the robot wearing a hood, to conceal its metal features, and stealing from the rich to give to the poor. For some reason, I find the idea of a robot Robin Hood lumbering around the BBC’s early Saturday evening TV show, accidentally knocking trees over and delivering the same lines but in an emotionless, electronic voice very appealing. This prog’s notable first: Glen Fabry draws a Slaine pin-up! Why I stayed in love with 2000 AD at around this time is a bit of a mystery to me which is daft as I should know because I was there. We’ve only just come out of a four week run of Judge Dredd stories drawn by Kim Raymond with this prog while, for the last few issues, ever since DR and Quinch and Slaine finished, we’ve been experiencing a high density of fillers. In this prog alone there are three Future Shocks. Admittedly, one is labelled “Time Twister” and another goes simply by its story name alone but these are still Future Shocks with pseudonyms in my eyes. Further padding has been provided by reoccurring pages of reader’s art. I find enthusiastic drawings of Kojak dressed as Tharg (“who loves ya, Earthlet?”) and Judge Phantom Flanflinger as entertaining as the next Squaxx dek Thargo but, really, there is a limit. Keep the reader-art-chuckles to the Nerve Centre, that’s what I say. The “Future Shocks” haven’t been all bad. Alan Hebden and Pete Milligan (back after a long break since his premier in prog 216) have written some entertaining yarns while John Casanovas and the currently regular-thrill-less Massimo Bellardinelli provide some eye popping artwork but there are only so many stories with twists that I can take in a single comic. I advise limiting the “Future Shock” to no more than one an issue from now on. It doesn’t make sense to me now that I stayed with the comic during this dreary period when I didn’t last very long after the circuit blowing prog 335 re-launch featuring Nemesis the Warlock, Slaine and the return of Strontium Dog. All I can think is that I must have read about the start of the new thrill written by Alan Moore, The Ballard of Halo Jones, a promotional pin-up of which appears on the back cover, and had decided to wait around for it for it. Inside this prog is a Slaine “action figure”. Well, Tharg says it’s an “action figure” but actually it’s a drawing by art editor Robin Smith of Slaine which readers are instructed to cut out and stick onto cardboard. If this is an action figure then it’s one of those with zero points of articulation. If in 2008, a comic claimed on its front cover that it contained an action figure inside, then you would be pretty much pissed off if this was what you got. In fact, I would go as far to say that you might have a good case to sue them under the trade’s description act. (The act that we all seem to know a lot about but few of us has read). 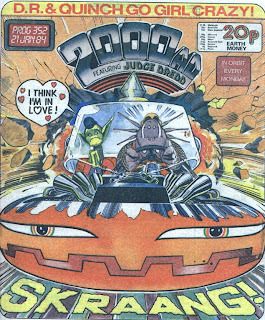 Despite openly admitting to being in love with 2000 AD by this prog, I wasn’t that infatuated with it that I couldn’t spot an inappropriate art robot on the coveted Judge Dredd when there was one. Kim Raymond was an artist whose scrappy style seemed jarring in comparison with others who had worked on it recently. He/she seemed to have arrived from nowhere without having done apparently any sort of apprenticeship, such as hovering around the industry for months before being offered high profile and regular work like Steve Dillon and Alan Davis had to. Why, for example, was Cliff Robinson, an obviously appealing artist, drawing Future Shocks when he was made for Judge Dredd and Raymond was more suited to them instead? Encountering Raymond’s Judge Dredd again twenty four years later, I can see now that his/her ability is actually quite good. The error here is the thrill with which he/she was tasked. 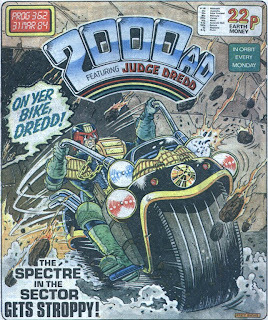 I can only presume that this occurred because he/she had an ability to keep to deadlines, an attribute that Tharg must have thought of as valuable considering the absence of file Judge Dredd thrills in 1984, as demonstrated by the recent reprint of Mutie the Pig. Raymond’s art style wasn’t suited for over violent sci-fi, in my opinion. He/she would have been better off drawing romance comics, if they weren’t all photo-strips at the time. 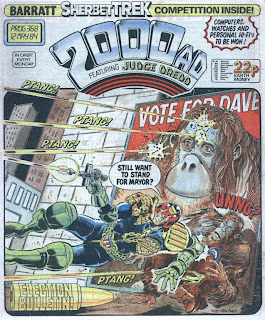 This prog wraps up a charming three part Judge Dredd tale, Portrait of a Politician, which charts the rise of Dave the orang-utan from bar hang out to mayor of Mega City One. I have fond feelings this story. First time around, I understood that Dredd can deliver the multi-part epics without a sweat, but with this, and the recent Citizen Snork in which a young man aims for Mega City notoriety by growing the world’s biggest nose, I learned that the thrill can deliver the small, human stories also. Admittedly, these stories contain at least a glimpse of Judge Dredd violence and a big dollop of the absurd but this helps to emphasise the humanity, if anything. In this story, it would be easy to portray the characters as ridiculous for voting an ape mayor of America’s largest city, but creator robots John Wagner, Alan Grant and Ron Smith understand that the public have a sense of humour and it’s this which helps make Portrait of a Politician a memorable political satire. In Dragonheist, Slaine and Ukko arrive in Wales where they meet Nest for the first time. A male dragon is roaming the local area and eating people, particularly relatives of Kicva, poor cow . Slaine and Ukko have decided to steal one of Nest’s farmed dragons intending to fly it home. Script robot Pat Mills is the driving force behind the consistently high quality of Slaine since it began thirty-six progs ago. Mills’ strength has always been in the conception of a strip but in the past I haven’t always felt that he’s acted on the solid foundation that he works so hard to create. This isn’t the case with Slaine. Here he matches John Wagner and Alan Grant’s work in its tightness and timing of script but there’s also satisfying detail. Dragonheist, for example, manages to be evocative because of the thought put into the rationalisation of dragon biology. The flammable venom that they generate, the bones in their throats that they rub together to ignite it, the diamond skulls and the way that they see; it all helps to make an entertaining story feel all the more substantial. At the back of 2000 AD, Rogue Trooper has decided that he can’t trust the recently re-gened Gunner. Who can blame him? The new Gunner is younger, fitter, stronger and, to add insult to injury after all he’s done for those ungrateful bio-chips, Helm and Bagman are gushing about how great he is. “Oh, aren’t Gunner’s new psychic skills fantastic?” says Helm. “Let Gunner carry me,” says Bagman. To make matters worse, Gunner seems to be constantly placing Rogue in dangerous situations with the Norts, which, he claims, is the real reason that he doesn’t trust him. If Gunner is deliberately placing Rogue in danger then I can’t blame him either. At the beginning of this story, You Only Live Twice, Gunner was supposed to have been smashed to smithereens and was left for dead by the others. In fact, it was only the gun that was destroyed. The bio-chip, all that is essentially left of Gunner from the Quartz Zone Massacre, was intact and later found by the soldiers that re-gened him. Rogue not checking the bits to see if the bio-chip is intact is like a fireman not checking the wreckage of a car crash to see if the driver is still alive. At a time where 2000 AD is running the thoroughly conceived Slaine, the amusing DR and Quinch, the satirically sharp Judge Dredd and the emotive Strontium Dog, Rogue Trooper holds up pretty well. This is partly down to the Cam Kennedy, now the definitive art robot on the strip, who creates Nu Earth environments that feel hostile and cold. When I read this first time around, I thought of Rogue Trooper as the weak link in the current chain of thrills, but re-reading these episodes now in quick succession, I find it very enjoyable. Item: I’m pleased to report that Judge Dredd The Haunting of Sector House 9 is as enjoyable to re-read as it was in my memory. There are the obvious Dredd tales that last in the consciousness of old school 2000 AD readers and there are others, such as this, which should also. What I find particularly striking about this story is the faultless timing of writers Wagner and Grant and the bold artwork of Brett Ewins. Of course, this is the first big Dredd adventure since my commitment to 2000 AD with prog 350, so my affection for it may be entirely personal but being able to report that it hasn’t aged is a good thing, right? The Haunting of Sector House 9 sees the broadening of judge nationalities with the introduction of Judges Patel and, head of Psi Division, Omar. 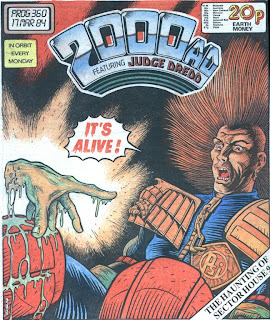 Prior to this story, we had Judge Giant, who died at the end of Block Mania, and even Dredd himself, some might say, before the colourists got to him. Ewins seems to enjoy drawing a diverse range of judge faces and haircuts and I wonder if this extension of the cultural mix is down, in part, to him. This prog’s notable first: The original and best of the Brian Bolland influenced art droids, Cliff Robinson, makes his first appearance this prog in the Future Shock, Dead Reckoning. Robinson fascinates me for the simple reason that his output, for years, seems to match that of somebody who draws in his spare time for fun rather than that of a professional. Judge Dredd is proving so popular with the readers that someone within IPC, the publishers of 2000 AD and the secret organisation behind Tharg the Mighty, is now considering giving the character his own comic. 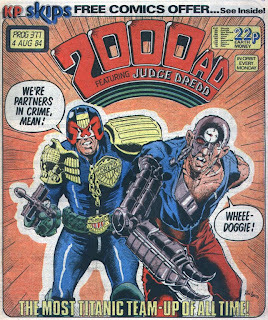 Who would have thought that when 2000 AD started that this could ever have been a possibility and who could have thought by the end of The Cursed Earth saga that it could take IPC so long to even consider the idea? 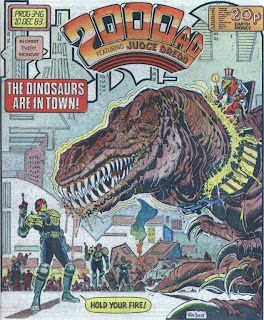 In this prog, there is a readers’ survey, the thrust of which is to gauge Squaxx dek Thargo response to the notion of Judge Dredd having his own fortnightly comic. It includes questions like, what is the most you would be prepared to spend on each issue. I don’t know about you but if I had bothered to fill it in at the time I would have selected the lowest total in an attempt to influence the final price of the comic which, to my mind, was inevitable. Judge Dredd’s own comic was inevitable all right; it was just at least another six years away. What about the responses to this survey discouraged IPC from moving forward with it at the time is anyone’s guess. I had always presumed that management with only a passing knowledge of 2000 AD were unable to comprehend the notion of such a young character being popular enough to support their own title in a market where other comics rarely lasted very long. One of the motivators for blogging The Slog was a belief that the first ten years or so of 2000 AD is comparable to the creative flourish that Marvel went through during the Silver Age of comics. The number of iconic characters and timeless stories that Tharg’s art and script robots came up with between them matches or even surpasses that of Stan Lee, Jack Kirby and Steve Ditko during the early sixties. However, whereas even the most cynical and arty of comic journalists seem willing to acknowledge the importance of early Marvel comics, they appear indifferent to the age of Tharg which took place in the UK between 1977 and the late eighties. If you are able to accept this premise, then, to me, the 2000 AD equivalent of Jack Kirby and Steve Ditko is Mike McMahon. Even during my wilderness years, where I bought 2000 AD occasionally but was unable to commit to it, I never had any doubt about McMahon’s artwork. It has always been stunning to me, working on the same parts of my brain that a Jack Kirby fight and a Steve Ditko nervous breakdown did. 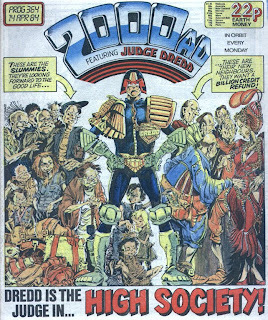 I don’t need copies of the comic to remember with absolute clarity the image of Judge Dredd tearing out into The Cursed Earth for the first time or the planet from the Hayden Systems being smashed open like a rotten orange during The Judge Child Quest. In the current Slaine story, Sky Chariots, we are seeing the best McMahon artwork ever. Each page, each panel is perfectly designed, where the gaps are as important as the casually applied, beautifully detailed images. It makes Frank Miller’s 300 look like the pale imitation that it is. Last prog, we saw two flying boats spill their crew into each other in one of the most stunning comic images I’ve ever seen. Hundreds of smelly men wave their stone axes and swords at each other as they try to maintain their balance at the same time. In this prog, a volcano erupts showering the crew in molten lava and blowing another of the boats out of the sky. McMahon draws pinched noses, squinting eyes and toothless mouths with a confidant flick of the wrist. His artwork on Slaine looks as if he’s cut out the middle process; dispensed with the paper altogether and scratched the artwork directly into the printing plates. Wow. 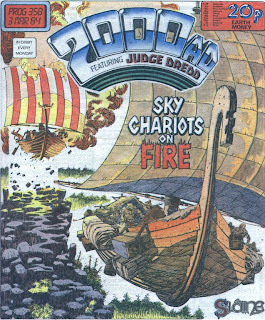 Although he returns to 2000 AD very occasionally after Slaine, it’s so infrequent that it doesn’t seem wrong to think of Sky Chariots as being the end of the McMahon era. And what a way to go. McMahon shouldn’t just be an international superstar like his peers Brain Bolland and Dave Gibbons as, to my mind, he is much bigger than that. 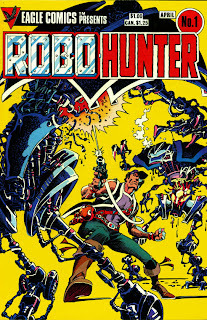 In this prog, there’s as advertisement for Robo-Hunter number one, the Eagle Comic repackaging of the first four episodes of Sam Slade’s trip to Verdus and some Dave Gibbons drawn Harlem Heroes as back up for the American (and specialist) comic market. Eagle, which is some sort of subsidiary of Titan who we already know for repackaging 2000 AD material for the book trade, has been around for a few months now with six issues of Judge Dredd under its expanding belt already. As someone who took such a long time to wake up to the joy of 2000 AD, the Eagle Comics were an essential way for me to catch up on all that I had missed. I could have gone with the Titan books but they didn’t seem to be particularly good value for money to me. Eagle Comics were in colour behind all new covers by the artists most associated with the characters and who were, usually, better known in America. Often, the covers were worth the purchase in their own right. There were problems though. American comics weren’t just a different size to 2000 AD but also a different shape. This meant that Judge Dredd “colourist” John Burns (a great artist in his own right, as you should know) was also required to re-size the artwork as well as colour it in. Burns’ method was to extend the height of the panels and draw extra bits onto them. This meant that the reproduction of the original artwork was tiny and often the reader didn’t have to look very hard to see the join. It wasn’t all bad though. When Eagle repackaged the first three books of Nemesis the Warlock, the “colouring” was done by original artist Kevin O’Neill. For the re-sizing he often drew all new panels. Another problem for me is that the order of the material repackaged seemed determined by the popularity of the creator in America. This wasn’t any more obvious than with Judge Dredd where, for example, all of Judge Death’s appearances had been published by issue three because they were all drawn by Brian Bolland. This policy resulted in stories appearing out of order and an incorrect sense of the quality dropping with each progressive issue. 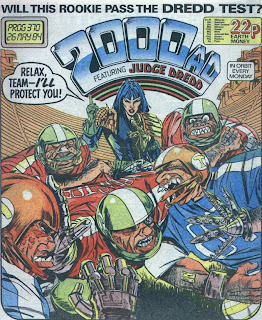 It was as if Eagle Comics was certain that their agreement to repackage 2000 AD material would not be renewed once it expired. A recent entry in the Forbidden Planet International blog commented on how strips that Alan Grant had a hand in, such as Judge Dredd and Strontium Dog, remain relevant today. Currently, The Slog is at the beginning of 1984, and the stories, particularly Strontium Dog, continue to resonate. Normally, nothing dates faster than science fiction, but many 2000 AD stories from twenty three years ago remain fresh and relevant today. In Strontium Dog The Killing, Johnny Alpha and Wulf Sternhammer take part in a murder competition. All entrants have to kill each other. The winner is the last man (or blob) standing (or sliding). Johnny and Wulf use The Killing as an opportunity to collect bounties but as one of the Despots of Zed asks at the end of this prog’s episode, what will happen when the last two standing is this pair of close friends? Fundamentally, Strontium Dog is bound to have a connection with young working class boys in Thatcher’s Britain because it’s about the limited options available to you due to the circumstances of your birth. The Killing, like all good Strontium Dog stories, features many of the themes which spin out of the thrill’s core. There are the Despots of Zen, the top of the social pile, watching The Killing, a competition created for their amusement, making ill considered decrees, and there are the competitors, slaughtering each other rather than uniting and opting out of the game altogether. What could be more timeless than that? When the alpha-thrill that is supposed to feature in every prog doesn’t appear in a new episode due to some error or other, then there is only one person to blame I would have thought; Tharg. 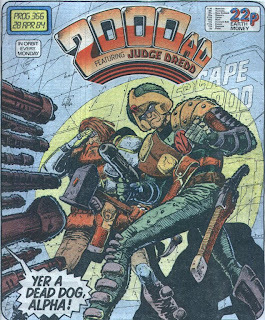 For last prog and this, the Judge Dredd strips have been a reprint of the two part Mutie the Pig story from 2000 AD’s first year. Why there aren’t unpublished Judge Dredd stories on file in case of this sort of problem, I don’t know. Shame on you, Tharg! Shame on you! I’m not laughing at DR and Quinch as much as I thought I would and am worried that I might have become over familiar with the strip during the eighties. After originally reading them in the weekly, I also picked up the Titan Book collection, Guide to Life, a year or two later and the colour reprints for the North American market. However, Alan Davis’ dumbstruck Quinch is always comforting to see and DR explaining to his new girlfriend that the letters in his nick name stand for Deeply Religious, this episode, made me smile. Rogue Trooper might be slipping down 2000 AD’s rating charts now but there’s something invigorating about seeing the thrill occupy the colour centre spread. Seeing Rogue’s bright blue skin set against Cam Kennedy’s traditional British war strip black and white artwork seems to elevate it in my eyes. 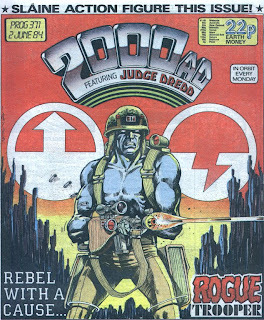 I might be programmed somewhat by my exposure to colour American comics but I’m pretty certain that, had Rogue Trooper occupied the colour pages earlier in his career, then it would have regularly beaten Judge Dredd in the readers’ poles. Nearly seven years after buying the first issue and flirting with the comic occasionally since, with this prog I become a loyal Squaxx Dek Thargo. Regular readers of The Slog won’t be surprised to learn that it was the Alan Moore and Alan Davis thrill, DR and Quinch, that reeled me in again but this time I didn’t go away for at least ten years. 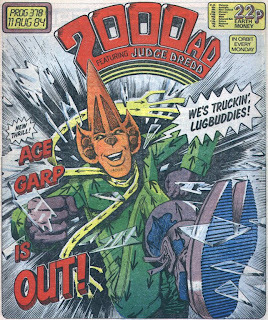 In fact, inside a month, I would say that I totally fell in love with 2000 AD. It was a bit like falling for the girl you had known all through secondary school on the last day of sixth form. Suddenly I noticed the wit of Judge Dredd, the beauty of McMahon’s Slaine and the heart of Strontium Dog. In fact, although attracted to 2000 AD on this occasion by the high profile Alans, I noticed now that its real beauty lay in the thrills and creators that I had previously taken for granted. 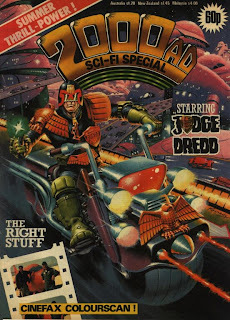 Take for example this prog’s Judge Dredd tale, Pieromania. In it, Dredd has a custard-substitute pie thrown into his face on live television which leads to a city wide craze of pie throwing. It reads like a tightly written, brilliantly timed political satire that manages to be completely entertaining. If I can feel this way about a comic where the lead thrill is drawn by the less than glamorous Kim Raymond then, surely, it must be love. I was already fed up with Warrior, where I had discovered the work of Alan Moore and which, early on, had been described unfairly as the “2000 AD for grown-ups”. Its frequency was unreliable, its ad count too big and its price relatively high. 2000 AD, however, was witty, self-deprecating, well written, well drawn and, at 20p, fantastic value for money. The only upsetting thing for me was I had wasted seven years on comics like Warrior and garish import American comics instead of on the real deal. I’m sorry, Tharg. Just when I feel safe that the festive season is now a fading memory, The Slog reaches Christmas 1983. 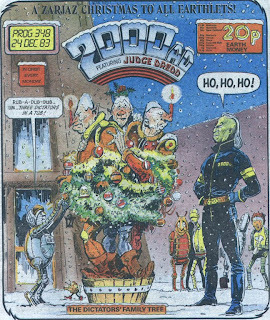 Fortunately, the seasonal theme starts with the cover and ends with Tharg’s editorial on page two. Book III of Nemesis the Warlock approaches its finale. Sir Hargan and his evil, human assassins close in on Nemesis’ mate, Chira. She puts up one hell of a ferocious fight but her murder next prog seems inevitable. Is this because I remember reading it first time around, in my case in the Eagle Comics US shaped reprints, or because 2000 AD is so determined to avoid sentimentality that it’s completely prepared to drag out the murder of a thrill’s hero’s wife over several episodes? Here’s another question; have I been so spoiled by Alan Moore’s finely crafted Future Shocks recently that Alan Grant’s current tales now seem as if they have been hacked out? In this prog’s Time Twisters, unnamed in the comic but titled Joggers according to http://www.2000adonline.com/, a series of bizarre events occur around the invention of a time machine. The story reads like it’s been beamed directly from Grant’s consciousness. I wonder if Grant, when tasked by Tharg to write this Time Twister, asked how long it should be and received the response, “Oh, I don’t know. Just keep writing and I’ll tell you when to stop.” At the end of Joggers, if indeed that is its name, the machine’s inventor, a journalist and two police men from the future have been stripped down to the underwear and lost their memories. The conclusion that they reach together is that, dressed as they are, they must all be joggers and the final panel sees them out for a run. Do you think that it’s safe for me to assume that Grant often forgot his gym kit when he went to school and now associates physical exercise with his vest and pants? Now that Strontium Dog is on a tiny break after completely failing to bring back a ten year old boy from the dead (duh), his slot, this prog, is replaced by a Future Shock called Quesera, Sera. Written by Alan Grant, using his pseudonym of Stavros, it’s a Superman parody that works like a very irritating bad joke. Superman saves a beautiful young heiress from an attempted kidnapper by punching him into the air. Later, she is going about her business when the kidnapper lands on top of her from Superman’s punch knocking her unconscious after which steals her jewellery. You might think that my description of it makes it sound quite good but actually it’s a newspaper strip gag stretched over two pages. This episode of Slaine explains the Celtic alphabet Ogham. One of my proudest moments is when, on one occasion watching Call My Bluff, I was able to explain to my house mate the meaning of the word ‘Ogham’ when it appeared behind the presenter and before any of the panel had presented their explanations. If there is any justice in the world, this is the sort of thing that would get you laid, just like buying issue one of Love and Rockets when it first came out should do too. (That’s right, ladies; I was there from the beginning). 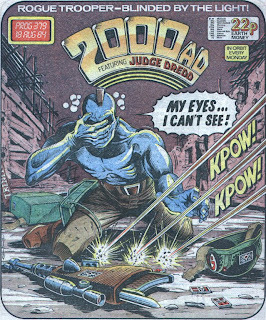 Regular readers of this blog will know that I often get myself into a muddle when it comes to understanding who does what and why when it comes to 2000 AD creator pen names. Usually, art robot Ian Gibson is credited using his real name but occasionally he is also referred to as Emberton and, less frequently, as Twerk. When I mentioned this before in The Slog I was told that Gibson tended to use Emberton on work that he was less proud of. The current Dredd story, Rumble in the Jungle, sees various Mega City One gangs converge in a sector for a big fight. After a long run of Robo-Hunter stories, Gibson seems to be enjoying the opportunity to work on something else, the art is filled with detail and activity, or so I thought until I notice that the work is credited to Emberton. Surely, Gibson can’t be embarrassed by his work here when it looks to me to be much better than some of his art towards the end of his recent period drawing Sam Slade. I wonder if Gibson uses a pseudonym when he draws a character or thrill Tharg dishes out to various art robots. For example, I’ve noticed that he has used ‘Twerk’ when drawing Future Shocks, a thrill that could be drawn by any artist. Does Gibson reserve his real name for stories that are to be thought of as belonging to him such as Robo-Hunter and Halo Jones?